Heat pumps for space and water heating, while increasingly common in the Lower 48, are often overlooked in Alaska. Most systems are designed to provide space heat in the winter and air conditioning in the summer. Traditionally, they have been installed in moderate climates, often in buildings that would otherwise use electric resistance heating. Now several varieties of heat pumps are available for colder climates and may be suitable for use in Alaska. Ground-source heat pumps differ from traditional geothermal heating; they can be installed across a wide range of geographic locations and ground temperatures. In contrast, traditional geothermal heating is restricted to relatively confined areas with abnormally high temperature gradients, such as near hot springs, and can thus be used to heat indoor spaces without the use of a heat pump. Approximately 50,000 Ground-source heat pumps and over 500,000 total systems are installed in the United States each year. Heat pumps in the right application can cut heating costs. The amount of savings is dependent on the cost of heating fuel, the cost of electricity, and the environment in which the heat pump is installed. Furthermore, a change from combustion based heating (oil, natural gas, propane, coal, or wood) to heat pumps will eliminate combustion appliances and their associated risks, pollution, greenhouse gas emissions, and maintenance. Because they are electrically operated, a widespread shift toward heat pumps will have consequences for electric utilities; distribution system upgrades may be necessary to accommodate the increased electrical demand. Building owners may also have to update their service entrances to handle the additional electrical load. One of the primary factors in evaluating a heat pump is the cost of electricity and the need for air conditioning. As a rule of thumb, if the cost of 30 kWh is less than the cost of a gallon of fuel, electric resistance heating may be more economical than oil heat. A heat pump installation may be more economical than oil heat if the cost of 12 kWh is less than the cost of a gallon of fuel. However, the capital cost of the heat pump is often significantly more than the cost of electric resistance heat or an oil heating system unless air conditioning is required. An example can be found in the Pacific Northwest. The hydropower supplied by the dams on the Columbia River has made electricity inexpensive in that region. As a result, much of the residential heating is done electrically, either with heat pumps or with standard resistance heating. A similar situation may occur in areas of the Alaska Railbelt that use oil for heating if, for example, the Susitna Dam is built. Heat pumps have been installed in several parts of the state, including the Mat-Su/Anchorage area, Juneau, and Kodiak. There have also been a few systems installed near Fairbanks, but these were primarily prototype installations and cost savings have not yet been demonstrated. The Alaska SeaLife Center proposes to employ a heat pump system that will “lift” latent heat from raw seawater at temperatures ranging from 35F to 55F, and transfer this heat energy into building heat at a temperature of 120F. Ground-source heat pump installations require either horizontal or vertical installation of heat exchanger loops below the ground. This requires significant heavy equipment, which may not be readily available in many parts of the state. For example, a drill rig is needed for vertical installations. In addition, these systems still require electricity to operate and become expensive to operate in areas where the cost of electricity, relative to fuel, is high. They may also be unsuitable for use in areas with permafrost, or where removing heat from the ground might result in permafrost growing or heaving. The combined high installation costs and potentially high operating costs may make these systems inappropriate for rural Alaska; however, they can prove economically viable in some road accessible areas of the state. 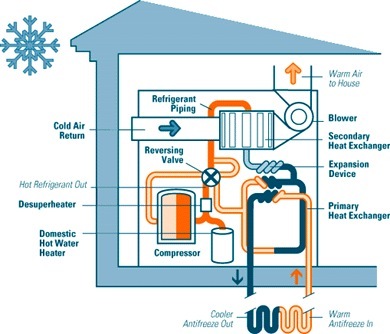 There are several installers of heat pump systems in Alaska, and local engineering firms can often design a system for a particular application. Expected payback period for an appropriately designed ground-source heat pump is 5–10 years. System life is estimated at 25 years for the in-home components and 50+ years for the ground loop. System retrofits in areas with oil as the primary heating source and with electrical costs under .13 per kWh have proven to be viable with oil costs above $2 per gallon. Conversion costs range from $25,000 to $30,000 for systems coupled to existing oil boilers with under floor radiant heat distribution already in place. The existing oil boiler acts as supplemental or backup heat for these installations. Systems also come configured for forced-air heating with the air handler built into the unit. There would be no backup heat for this type of installation, since the unit would take the place of the existing oil-fired air handler equipment. Hence, sizing would need to be adequate for the complete heating load of the home, or other backup systems such as electrical resistance heaters would be needed. In organized cities and service areas permits are required for any heating installation. Lake loops generally require a permit process with several governmental agencies involved, such as the Alaska Departments of Environmental Conservation (DEC), Natural Resources, U.S. Fish and Wildlife, and U.S. Army Corps of Engineers. For open well systems, a less rigorous permitting process is required from DEC. A pilot project is currently in place and conditionally approved for permanent operation. Results from this pilot project and approval will pave the way for open well systems to become routine for the permitting process. Other systems such as closed loop horizontal or vertical installations are more routine and have not been subject to permitting in unorganized areas. Heat pumps may become more common in Alaska in places that have expensive heating fuels and relatively cheap electricity. They are relatively easy to engineer, design, and install; and they can save energy. A general recommendation on when to install a heat pump over a traditional system is beyond the scope of this wiki. The decision must be based in part on the available thermal resource, the cost and availability of electricity, the cost of fuel, and capital costs. Specific recommendations will vary by region and are currently done on a case-by-case basis. Heat pumps, while electrically operated, are distinctly different from resistance electrical heaters. Heat pumps are devices that transfer heat from a lower temperature reservoir, usually the ambient environment, to a higher temperature sink. The low temperature reservoir is usually the air, the ground, or a body of water, and it is essentially an unlimited source of heat. This heat, while unlimited, does not come without cost; work in the form of electricity is required to pump it to the high-temperature sink. Heat pumps work on the same principle as refrigerators and air conditioners. All remove heat from a cold temperature source and pump it to a higher temperature sink. The difference is simply in the desired effect – cooling vs. heating. 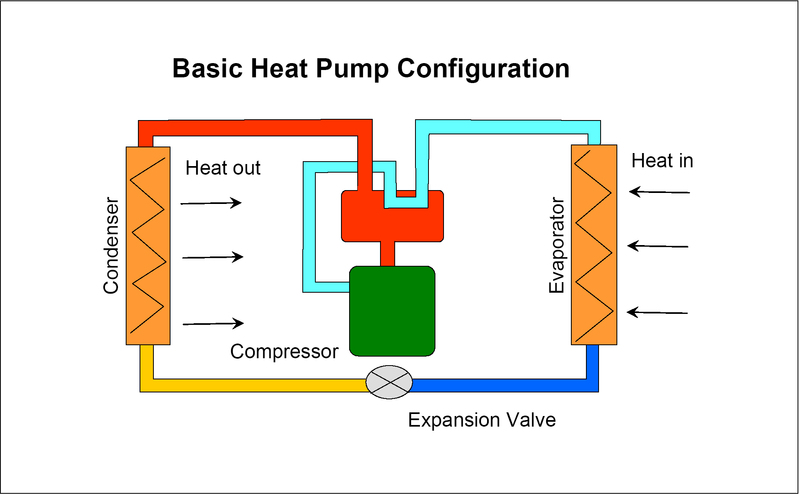 A simplified heat pump contains four main parts: a cold source heat exchanger called the evaporator, a compressor, a high-temperature heat exchanger called the condenser, and an expansion valve. This system is filled with a working fluid, such as the refrigerant R‑410A. A diagram of this system is shown here. In the evaporator, heat is absorbed, vaporizing the refrigerant. This vapor is then compressed, raising its temperature and pressure. The now hot refrigerant vapor is piped to the condenser, where its heat is removed and used for heating. During this heat transfer process, the refrigerant condenses back to a liquid. This liquid then passes through the expansion valve to the low-pressure side of the system, and the cycle repeats. The effectiveness of a heat pump is called its Coefficient of Performance (COP). The COP is the ratio of heat output to work input. For example, a heat pump operating with a COP of 5 will produce 5 kWh of heat for every 1 kWh of electricity supplied. For this reason, the ‘efficiency’ of a heat pump is often listed as greater than 100%. The COP is largely dependent on the temperature difference between the source and sink, and the greater the difference, the lower the COP. For example, a heat pump operating between a ground or air temperature of 45°F and an inside temperature of 70°F has a much higher COP than the same system operating between 0°F and an inside temperature of 70°F. Typical COPs for heat pumps tend to be in the range of 1.5 to 6. This is sometimes described as an efficiency of 150% – 600%. Heat pumps are classified as either air-source heat pumps or ground-source heat pumps. Air-source heat pumps, as their name implies, extract heat from the ambient air. They are the easier and less expensive type to install. Because the COP is a function of the outdoor air temperature, it will vary widely. This variable COP shows one of the air source heat pump’s main disadvantages in cold climates – peak heating demands coincide with the unit’s lowest COP. Heat is therefore most expensive when it is most needed. Nonetheless, there are a number of recent innovations that have led to the development of air-source heat pumps suitable for use down to 0°F. Ground-source heat pumps have been in use since the late 1940s and use the relatively constant temperature of the earth instead of the outside air for the heat source. This allows the systems to operate with a higher COP in colder weather, making them more appropriate for use in much of Alaska. As with air-source heat pumps, the COP is highest when the difference between the ground temperature and indoor temperature is lowest. Therefore, the colder the ground, the less efficient the system. There are many configurations for ground-source heat pumps, including an open loop heat pump that pumps water directly from a well or body of water and extracts heat before returning the water back to the same water body or to another one. A dual source heat pump combines an air-source heat pump with a ground-source heat pump. Alaska Energy Engineering LLC, Ground-source Heat Pump Feasibility Study: Life Cycle Cost Analysis, December 2007.